Responding to President Obama's State of the Union address on behalf of the Republican Party, Sen. Marco Rubio, R-Fla., tonight made the case that the president's calls for government investments are misguided and potentially destructive. While agreeing with the president on some issues and taking an optimistic tone for the future, Rubio sought to offer a conservative alternative to the president's agenda, one which takes decision-making out of Washington. Opportunity, Rubio said, "it isn't bestowed on us from Washington. It comes from a vibrant free economy where people can risk their own money to open a business." In his address before a joint session of Congress, Mr. Obama told lawmakers, "We need to build new ladders of opportunity into the middle class for all who are willing to climb them." The president laid out a series of actions Washington can take to revive the economy, including investments in the private sector. Rubio, however, charged tonight that Mr. Obama considers a free enterprise economy as "the cause of our problems." "His solution to virtually every problem we face is for Washington to tax more, borrow more and spend more," Rubio said of the president. "And the idea that more taxes and more government spending is the best way to help hardworking middle class taxpayers - that's an old idea that's failed every time it's been tried. More government isn't going to help you get ahead. It's going to hold you back. More government isn't going to create more opportunities. It's going to limit them." The president did reiterate his insistence that economic growth requires "everybody doing their fair share," alluding to tax reforms. Mr. Obama also insisted, "It's not a bigger government we need, but a smarter government that sets priorities and invests in broad-based growth." He said none of his proposals would increase the deficit. The president did, however, suggest specific government investments, such as a "Fix-It-First" program to put people back to work repairing infrastructure across the country. He also suggested initiatives such as working with states to make high-quality preschool available to every child in America. Such investments would pay off financially in the future, he said. Rubio addressed areas in which Republicans believe government should act, such as energy policy: "Of course solar and wind energy should be a part of our energy portfolio," he said. "But God also blessed America with abundant coal, oil and natural gas. Instead of wasting more taxpayer money on so-called 'clean energy' companies like Solyndra, let's open up more federal lands for safe and responsible exploration." He called for student aid that "does not discriminate against programs that non-traditional students rely on," such as online courses. The senator addressed one of the most hot-button issues of the moment, calling for a plan to reduce gun violence. However, he added, "unconstitutionally undermining the 2nd Amendment rights of law-abiding Americans is not the way to do it." 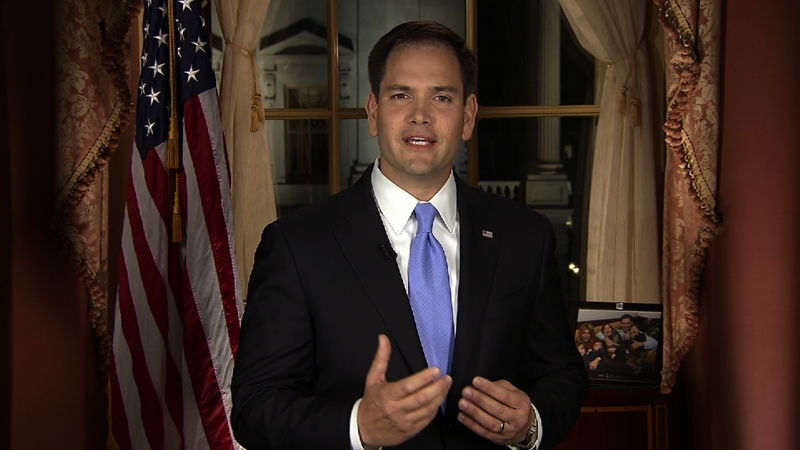 Rubio also defended the controversial Republican plan to partially privatize Medicare. "Republicans have offered a detailed and credible plan that helps save Medicare without hurting today's retirees," he said. "Instead of playing politics with Medicare, when is the president going to offer his plan to save it? Tonight would have been a good time for him to do it." While sharply criticizing Mr. Obama on some issues, the Republican senator did find some areas of commonality of the president. Both want to simplify the tax code and reform the nation's immigration system. "We can also help our economy grow if we have a legal immigration system that allows us to attract and assimilate the world's best and brightest," Rubio said. "We need a responsible, permanent solution to the problem of those who are here illegally. But first, we must follow through on the broken promises of the past to secure our borders and enforce our laws." Rubio is part of a bipartisan group of senators working on immigration reform, and as a Cuban American, his ascending position in the Republican Party stands as a symbol of the GOP's efforts to reach out to Latinos. Rubio delivered his remarks tonight in both English and Spanish. The up-and-coming senator, elected with tea party support in 2010, also spoke to viewers tonight about coming from a family of immigrants. "My parents immigrated here in pursuit of the opportunity to improve their life and give their children the chance at an even better one," he said. "They made it to the middle class, my dad working as a bartender and my mother as a cashier and a maid. I didn't inherit any money from them. But I inherited something far better - the real opportunity to accomplish my dreams." While delivering the minority party's response to the president's State of the Union address is a great opportunity for a lawmaker to increase his profile, it can also be a perilous moment, leaving one open to criticism. Rubio smiled throughout his address, but in one uncomfortable moment, he stooped down off camera to grab a plastic bottle of water.